Rugby union is the unofficial national winter sport of New Zealand. The national team, the All Blacks, ranks as the top international team in the world. The sport has been known in New Zealand from 1870. The top domestic competitions are the semi-professional ITM Cup and amateur Heartland Championship, and above them Super Rugby, in which New Zealand has five franchises. The country co-hosted and won the first ever Rugby World Cup in 1987, and hosted and won the 2011 Rugby World Cup. They are the current world champions for men. Various Nelson and Wellington. By the following year, the game had been formalised in Wellington, and subsequently rugby was taken up in Wanganui and Auckland in 1873 and Hamilton in 1874. 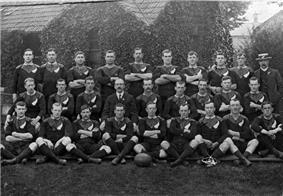 In 1875 the first representative team was formed, being a combined-clubs Auckland team which toured the South. It is thought that by the mid-1870s, the game had been taken up by the majority of the colony. The latter stages of the 1870s saw the emergence of a more formal structure, with Unions being formed in both Canterbury and Wellington during 1879. In 1882, the first international rugby side toured New Zealand, a New South Wales side that visited both islands during the latter part of the year. Two years later, a New Zealand team visited New South Wales, wearing blue jerseys with a golden fern. The team won all their games. 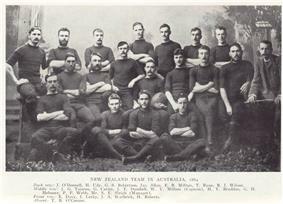 In 1888, the first ever British Isles rugby team tour took place, visiting New Zealand and Australia. The visitors won all their New Zealand games except for one, losing to Auckland. During 1888-89, the New Zealand Native team became the first from a colony to visit Britain. In 1892 the New Zealand Rugby Football Union (NZRFU), now known as the New Zealand Rugby Union (NZRU), was established, to act as the national governing body of the sport. Following the establishment of the national governing body, the first NZRFU national sanctioned tour was undertaken in 1893, when a ten-game tour of Australia was played. The team was captained by Thomas Ellison. Gifford, Phil (2004). The Passion - The Stories Behind 125 years of Canterbury Rugby. Wilson Scott Publishing. Palenski, Ron (2003). Century in Black - 100 Years of All Black Test Rugby. Hodder Moa Beckett Publishers Limited. Malcouronne, Peter; Gasteiger, Arno (2010). Our Game: Grassroots Rugby in Aotearoa. Kowhai Publishing. ^ "World Rugby Rankings". World Rugby. 14 June 2015. Retrieved 15 June 2015. ^ Wright-St Clair, Rex. "Monro, David 1813 - 1877". ^ "New Zealand Rugby". activenewzealand.com. Retrieved 6 June 2006. ^ a b "The 1905 All Blacks Gave Life to Rugby League". rl1908.com. Retrieved 10 June 2006. ^ "Rugby in New Zealand". massey.ac.nz. Retrieved 10 June 2006. ^ a b c "New Zealand". IRB. Retrieved 2007-09-09. ^ "The New Zealand Natives' Rugby Tour of 1888/89". nzhistory.net.nz. Retrieved 10 June 2006. ^ "Rugby triumphs and national pride". teara.govt.nz. Retrieved 10 June 2006. ^ "The Māori Rugby Culture in New Zealand". rugbymag.com. Archived from the original on 17 May 2006. Retrieved 10 June 2006. ^ "Crowds flock to All Blacks training". rugby.com.au. Retrieved 10 June 2006. ^ "Over two million viewers tune in to RWC final". stoppress.co.nz. Retrieved 29 March 2014. ^ "Econ 327" (PDF). University of Canterbury. 2006. Archived from the original (PDF) on 2006-10-07. Retrieved 2007-02-14. ^ a b "All Blacks Test Match Record since first test match.". allblacks.com. Retrieved 2007-02-14. ^ "1st All Black Test : 45th All Black Game". allblacks.com. Retrieved 2007-02-14. ^ Palenski, Ron (2003). Century in Black: 100 Years of All Black Test Rugby. Auckland: Hodder Moa Beckett Publishers Limited. ^ Gilhooly, Daniel (2006-11-17). "'"Zinzan Brooke defends All Blacks - 'we can win the Cup. NZPA. Retrieved 2006-11-28. ^ NZPA (2006-11-03). "Heartland XV start with come-from-behind win". New Zealand Rugby Union. Retrieved 2007-01-05. ^ NZPA (2006-11-06). "Heartland XV beaten 13-35 by Tucuman". New Zealand Rugby Union. Retrieved 2007-01-05. ^ NZPA (2006-11-12). "Heartland XV go down to Argentina 15". New Zealand Rugby Union. Retrieved 2007-01-05. ^ "New Zealand Heartland XV notch first up win". New Zealand Rugby Union. 2008-11-03. Retrieved 2009-01-25. ^ "New Zealand Heartland XV win final tour game". New Zealand Rugby Union. 2008-11-09. Retrieved 2009-01-25. ^ "NZRU to make budget cuts in 2009". New Zealand Rugby Union. 2008-12-18. Retrieved 2009-01-25. ^ "NPC makeover - everyone's a winner". nzherald.co.nz. 2005-06-03. Retrieved 2006-05-11. The World Rugby Sevens Series, held annually since 1999–2000, is a series of several international tournaments, expanding from nine to ten for the upcoming 2015–16 series, featuring full international sevens teams. New Zealand have been the dominant team throughout the series' history, winning the first six editions (2000–2005), and again in 2007, 2008, and 2010–2014. New Zealand hosts one leg, the New Zealand International Sevens, at Westpac Stadium in Wellington. The Rugby World Cup Sevens is World Rugby's equivalent to the (15-man) Rugby World Cup. It is also held every four years, and was originally scheduled in the odd-numbered years in which the 15-man RWC was not held. The competition was first held in 1993. New Zealand won in 2001, were losing finalists to Fiji in 2005, and won the most recent edition in 2013 in Moscow. The 2013 edition was originally intended to be the last because of the impending establishment of an Olympic sevens tournament in 2016. World Rugby (then known as the IRB) later decided to retain the World Cup Sevens, and established a new four-year cycle in which the World Cup will be held in even-numbered non-Olympic years. As such, the next edition is to be held in 2018 in the San Francisco Bay Area. The Churchill Cup is a tournament originally intended to help build depth in rugby in Canada and the USA, and an opportunity to develop new players for the England national team. The New Zealand Māori along with the Black Ferns participated in the 2004 event, winning their respective tournaments. However, the following year, the Māori had to pull out as it conflicted with their fixtures against the British and Irish Lions. The Māori competed in and won the 2006 tournament. There was no women's event in either 2005 or 2006 due to Canada's preparations to host the 2006 Women's Rugby World Cup, and the women's tournament was never revived. As of 2008 the New Zealand Māori rugby union team will no longer participate as they will be competing for the Pacific Nations Cup. The Pacific Nations Cup is a competition that started in 2006 under the name of IRB Pacific 5 Nations involving the Junior All Blacks, Fiji, Japan, Samoa, and Tonga. In 2007, Australia A joined the tournament. The Junior All Blacks played their homes games at North Harbour Stadium, Yarrow Stadium and Carisbrook. The Pacific Nations Cup is an IRB tournament funded as part of the $US50 million, three-year, global strategic investment programme that was launched in August 2005. As of 2008 the New Zealand Māori rugby union team will be the team participating from New Zealand with the Junior All Blacks being left out. The Bledisloe Cup reflects the rivalry between Australia and New Zealand and has been contested since the early 1930s. The Bledisloe Cup was irregularly contested between 1931 and 1981, usually during tours by the two nations. During this period, New Zealand won it 19 times and Australia four times. In 1982 it became an annual contest, being contested either as a single game or in a three-test series. Between 1982 and 1995 New Zealand won the Cup 11 times and Australia three times. Since 1996 the Bledisloe Cup has been contested as part of the Tri Nations/Rugby Championship. In total, the All Blacks have won 67 Bledisloe Cup games, Australia 30, with four draws as of mid 2006. The Freedom Cup is contested between New Zealand and South Africa, first as part of the Tri Nations and now in The Rugby Championship. In 2012, Argentina joined the competition, which became The Rugby Championship. With four nations now involved, the tournament returned to a straight home-and-away format except In World Cup years, when it is conducted in a single round-robin format. The All Blacks won the first three editions of the renamed competition (2012–2014), giving them a total of 13 Tri Nations and Rugby Championship titles. The Tri Nations, now known as The Rugby Championship, is an annual competition involving the strongest rugby nations from the Southern Hemisphere. When the competition was established in 1996, it featured New Zealand, Australia and South Africa. Originally, this involved each country playing one home and one away game against both other countries. 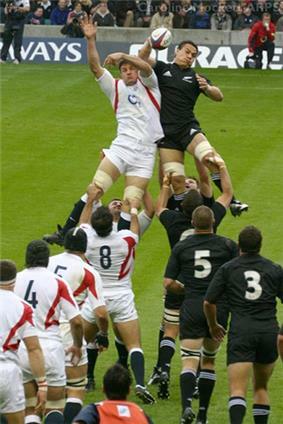 From 2006 the competition was expanded with each nation playing both the other nations three times (except in Rugby World Cup years, when it reverted to a home-and-away series). The All Blacks won the first series in 1996, as well as the subsequent 1997 series. They have been the most dominant team in the series; during the Tri Nations era (1996–2011), they won 10 titles to the Springboks' three and the Wallabies' two. The Rugby World Cup is considered the ultimate rugby competition. The New Zealand All Blacks won the first world cup in 1987, beating France in the final. Since then the All Blacks were favourites on several occasions, but did not win for another 24 years. New Zealand lost to Australia in the semi-final in 2003 and fell to the French team in the quarter-final of the 2007 Rugby World Cup. Intense lobbying by the NZRFU and the New Zealand Government helped New Zealand secure hosting rights to the 2011 Rugby World Cup. The All Blacks regained the World Cup on home soil in 2011. Each ITM Cup and Heartland Championship region conducts local intra-provincial club competitions. The club level is often followed by the local media and has local support. Clubs often rely on the Pub Charity in order to survive. In total, 520 clubs are affiliated to the NZRU. The Ranfurly Shield, also known as the Log of Wood, has been competed for on a challenge basis by provincial teams since 1904. The holding union must defend the Shield in challenge matches, and if a challenger defeats them, they become the new holder of the Shield. The Shield was first presented by the Governor of New Zealand, the Earl of Ranfurly. The current holders are Hawke's Bay. 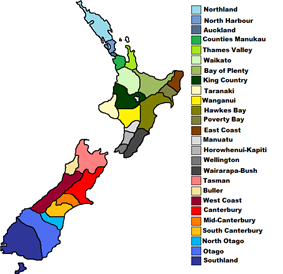 A map of NZRU provincial boundaries. The teams in teal are Air New Zealand Cup teams, whilst the teams in light blue are Heartland Championship teams. Beginning in 2011, the ITM Cup split into two divisions—the top-level Premiership and second-level Championship, each with seven teams. Promotion and relegation was reintroduced to the top level of provincial rugby; the winner of the Championship replaces the bottom team of the Premiership; the winner of the Meads Cup replaces the bottom team of the Championship. The ITM Cup, started in 2006 and known as the Air New Zealand Cup from its inception until a change in sponsorship for 2010, is the premier domestic competition in New Zealand rugby. A fully professional competition contested by 14 provincial teams, it is the successor to Division One of the country's former domestic competition, the National Provincial Championship (NPC). Map of all provincial unions within New Zealand. New Zealand teams have dominated Super Rugby for much of its history, winning 12 of the 18 titles decided to date. The Crusaders are the most successful club, having won 7 titles in 1998, 1999, 2000, 2002, 2005, 2006, and 2008. The Blues, Highlanders & Chiefs are the other New Zealand teams to have captured the title, the Blues having won in 1996, 1997 and 2003, the Chiefs winning in 2012 and 2013 and the Highlanders winning in 2015. Australia's Brumbies (two titles), Reds (one) and NSW Waratahs (one) and South Africa's Bulls (three) are the only teams from outside New Zealand to have won a title. The competition will be further reorganised in 2016 with a permanent sixth team from South Africa and new entries based in Argentina and Japan. At that time, the competition will split into Australasian and African groups (with the latter including the Argentine and Japanese teams), each in turn being divided into two conferences. All of the New Zealand teams will form one conference. The finals series will expand to eight teams, with the top team from each conference, plus the top three non-winners from the Australasian group and the top non-winner from the African group, qualifying. With the expansion to 15 teams, the competition format was dramatically changed. The league phase, originally a single round-robin, was replaced by a three-conference format, with each conference consisting of teams in one of the participating countries. Each team plays home-and-away against the other teams in its conference, plus single games against four teams in each other conference. The finals series was also changed. In the Super 12 and Super 14 eras, this was a knockout series involving the top four finishers. The knockout format was retained for Super Rugby, but now involves the three conference winners plus the top three non-winners without regard to conference. Currently, five New Zealand teams participate in the competition, these being Crusaders, Blues, Hurricanes, Chiefs and Highlanders. Super Rugby is an international competition featuring teams from New Zealand, Australia and South Africa. The competition, governed by SANZAR, was formed in 1996 as Super 12 after the game turned professional. It became Super 14 in 2006 with the addition of one team each from Australia and South Africa, and Super Rugby in 2011 when a fifth Australian team joined. The current format includes five teams from each participating country. The New Zealand Schoolboys rugby union team is for secondary school students to help them aim for and achieve higher honors. New Zealand Schoolboys team is a great team to start out in and it brings you into the international scene early on. Famous past schoolboy players include Aaron Mauger, Mils Muliaina, and Joe Rokocoko. New Zealand formed an Under 20 side for the first time in 2008. The catalyst for the creation of this side was World Rugby's decision to scrap its under-19 and under-21 world championships in favour of a single under-20 tournament, originally known as the IRB Junior World Championship and now known as the World Rugby Under 20 Championship. The side won the first four editions of the competition (2008–2011), and again in 2015. The New Zealand Under 21s rugby union team is for players aged under 21. New Zealand Under 21 (formerly Colts) was first selected in 1955 and played annually until 2007. The Under 21s enjoyed great success on the world stage, winning world titles in 2000, 2001, 2003, and 2004. Sevens is a form of rugby union which involves 7 players per team rather than 15 in the regular game. The games are 7 minutes per half (10 minutes in a competition final) rather than 40 minutes per half in the 15-man game. The New Zealand Sevens team compete in the World Rugby Sevens Series, the Sevens World Cup, and the Commonwealth Games Sevens. The New Zealand Sevens team were undefeated in the Sevens events in the Commonwealth Games until 2014, when South Africa defeated them in the final. Since the inception of the Sevens Series in 1999–2000, the New Zealand Sevens team have dominated the series, winning the first six seasons of the competition (2000–2005) and 12 times in all, most recently in 2014. The Black Ferns are the top national women's team in New Zealand. They are the current Women's Rugby World Cup champions, being 3 time winners after they won the 1998 tournament then again in 2002 in Barcelona and again in 2006 in Canada. Shortly after the tour, the NZRU announced that the Heartland XV would not be assembled in 2009, and would in the future tour every two years. Their second tour, in November 2008, was a two-match trip to the USA. The first match, in San Francisco, saw them defeat a Pacific Coast XV 39–12. They then travelled to Salt Lake City to take on a USA Select XV in one of the first events held in the new Rio Tinto Stadium, and came from behind to notch a 19–14 win. Previously known as the New Zealand Divisional XV, this team was revamped in 2006. Only players who have participated in the previous season's Heartland Championship are eligible for selection; this makes it effectively a Heartland all-star team. This team traditionally goes on second-level tours; their first tour under the Heartland name was a 2006 end-of-year tour to Argentina, where they played two provincial teams and the Argentina A side, splitting the provincial matches and losing to Argentina A. The Māori All Blacks, previously known as New Zealand Māori, is a representative side that traditionally play teams touring New Zealand. A prerequisite for playing in this team is that the player must be at least 1/16 Māori descent. Due to the number of New Zealanders with some degree of Māori heritage, a large number of New Zealand rugby players are eligible. The team was formerly established in 1910, and has played many of the world's top Test teams, beating teams such as England, Ireland and the British and Irish Lions. The Junior All Blacks are not an age grade side, but are the second national team behind the All Blacks. They were formerly known as New Zealand A, but the name was changed for marketing purposes. They compete in the Pacific Nations Cup competition alongside Australia A, Fiji, Japan, Samoa and Tonga. They won the inaugural IRB Pacific 5 Nations competition in 2006. In 2007 Australia A joined with the competition, changing its name to Pacific Nations Cup. The Junior All Blacks repeated their 2006 success in 2007 winning the competition with victories in all five of their matches including with a 50−0 thumping of their Australian counterparts at Carisbrook Dunedin. The New Zealand Māori played in the 2008 Pacific Nations Cup. New Zealand, commonly referred to as the All Blacks, are the most successful team in international rugby. They have a positive winning record against all Test nations, and have a win record of over 74% The first All Blacks Test match was played against Australia at Sydney Cricket Ground on 15 August 1903. New Zealand won 22 - 3, with The Sydney Morning Herald saying, 'The present New Zealand team have shown form so far in advance of every fifteen opposed to them that it seems almost impossible for Australia to put a side into the field with any hope of victory...'. The major rugby playing nations of Scotland, Ireland, Italy and Argentina have yet to defeat the All Blacks in a test match. The All Blacks were winners of the inaugural Rugby World Cup in 1987 and were runners-up in 1995. The All Blacks were the only team to have reached the semi-final stage at every World Cup until the 2007 World Cup where they were defeated 20-18 by France in the quarter-finals. New Zealand won its second Rugby World Cup on home soil in 2011. 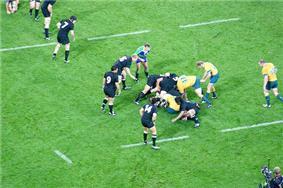 The All Blacks playing the Wallabies. The New Zealand Rugby Union (NZRU) is responsible for rugby in the country. The NZRU was formed in 1892 as the New Zealand Rugby Football Union with the original representation of seven unions though there was the original significant absence of Canterbury, Otago and Southland. The NZRFU joined the IRFB in 1949. There are 26 member unions within New Zealand. Every province also has its own union. In late 2005, New Zealand won the right to host the 2011 World Cup. Māori living in areas that had supported the Crown during the New Zealand Wars of the 1860s seem to have been the first to take up the sport. Jack Taiaroa and Joseph Warbrick were key members of the first representative New Zealand team, which toured New South Wales in 1884. In 1872, 'Wirihana' became the first recorded Māori rugby player when he turned out for Wanganui 'Country' in a 20-a-side fixture against their urban counterparts. 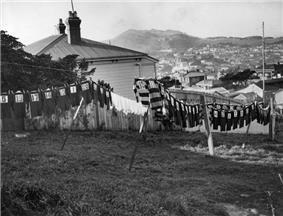 While some all-Māori clubs were formed, such as Kiri Kiri near Thames, mixed teams were more common in areas like Poverty Bay which had substantial Māori populations. Early forms of rugby had been played in New Zealand since the 1860s. While these were initially associated with the settler elite and the military, other colonists accustomed to hard physical labour also soon took part. In New Zealand there are 520 clubs, 141,726 registered players and 2309 referees. In colonial New Zealand, rugby football served to hold loyalty to the Crown within the emigrant population, whilst introducing British culture to the Māori population. It was the New Zealand Natives' Rugby Tour of 1888/89 showed that New Zealand could compete with other nations, something they had trouble doing in another traditional sport, cricket. Similarly, the 1905-06 tour, in which the All Blacks went very close to a clean sweep tour (one loss against Wales), helped to create a sense of national pride around the All Blacks, as they appeared physically superior and pulled off an admirable performance on their British tour. It is also thought that this saw the emergence of the Kiwi as a national symbol. Rugby dominates New Zealand's sports media. The Haka, a Māori ceremonial dance, which has been immortalised in popular culture by the All Blacks has become an iconic image of sport. 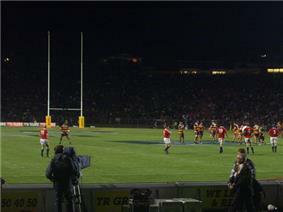 Being the unofficial national winter sport of New Zealand, Rugby attracts large sporting attendances and viewership. As many as 5000 people have turned out to watch All Black training sessions, while the final of 2011 Rugby World Cup was the single most watched television event in New Zealand history. There is a pay TV channel dedicated to rugby in New Zealand. In 1987, the NZRFU wrote to the International Rugby Football Board, later known as the International Rugby Board (IRB) and now as World Rugby, requesting the possibility of hosting an inaugural Rugby World Cup. The 1987 World Cup was eventually given to both New Zealand and Australia. The All Blacks made it to the final, where they would meet France. The All Blacks won and were crowned the first ever World Champions. In the 1980s, New Zealand provincial sides participated in the South Pacific Championship, along with teams from Australia and Fiji. In 1992 this type of competition was relaunched as the Super Sixes, and was expanded to the Super 10 later. As rugby entered the professional era in the mid-1990s, along with South Africa and Australia, New Zealand formed SANZAR, which would see them start a provincial rugby competition, the Super 12. The 1996 Super 12 season saw the Auckland Blues finish in second place, whilst the Waikato Chiefs 6th, the Otago Highlanders 8th, the Wellington Hurricanes 9th, and the Canterbury Crusaders 12th. The SANZAR agreement also saw the formation of the Tri Nations Series, a contest between the respective national sides, the All Blacks, Springboks and Wallabies. The All Blacks won the first series. Beginning in 2012, the Argentina Pumas entered the competition, which was renamed The Rugby Championship. New Zealand was supposed to jointly host the 2003 World Cup with Australia, but a disagreement with the IRB saw the tournament given to Australia in its entirety. In 2006, New Zealand won the right to host the 2011 World Cup. The 1981 Springbok Tour, or "The Tour", went down as one of the most controversial rugby tours ever. From July to September, the Springboks toured New Zealand. Rugby fans filled the stadiums, yet equal numbers of fans protested the games outside the stadiums. Police were divided into Red and Blue riot squads for the tour, and in preparation for possible trouble, all spectators were told to assemble in sports grounds at least an hour before kickoff. At a game at Rugby Park in Hamilton, around 350 protesters pulled down a fence and invaded the pitch. Police, already very worried, pulled the match when they found out a light plane piloted by a protester was headed to fly around the stadium. A protest turned violent in Wellington the following week, escalating the situation. During the final test match at Eden Park, a low flying plane dropped flour bombs over the pitch. These images were beamed around the world, and looked as though a civil crisis had engulfed New Zealand. A subsequent 1985 All Black tour was prevented by the High Court, but an unofficial tour took place the following year. They played an import role in rugby league. Meanwhile, New Zealander Albert Henry Baskervill had contacted the Northern Union to arrange a New Zealand tour, as he had just read about the game in the Wellington Post. The NZRFU discouraged any involvement from its players and officials, nonetheless, a team departed a travelled to Sydney first, and were there labelled the All Golds, a play on All Blacks in reference to the player payments. The team went on to tour England.